The Tax Cuts and Jobs Act—passed and signed into law late last year—has substantially reduced the tax burden on millions of Americans and small businesses and, now, we are reaping the rewards. Businesses from across the country are hiring more people, raising wages, distributing bonuses and expanding benefits as a result of the financial savings from the tax relief. And as a result, the economy is thriving. Unfortunately, some members of Congress have vowed to repeal the Tax Cuts and Jobs Act after the November midterm elections. Everyone who earns a paycheck deserves to know where their politicians stand on this issue. 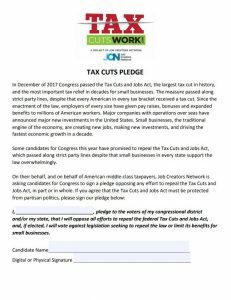 So the Job Creators Network (JCN) is asking every candidate for federal office to sign a pledge that they will not vote to repeal the Tax Cuts and Jobs Act if they’re elected in November. JCN will send the pledge to every incumbent member of Congress starting this week. They’ll ask challengers and open-seat candidates to sign the pledge as well. The pledge is part of a larger campaign, Tax Cuts Work, aimed at educating voters on how the tax cuts are boosting small businesses and the economy.